It was amazing. I was in awe. She is just as cool in real life as she is on her blog. She is funny and wonderful and faboo. I think I just had the best moment of my life. I can die a happy knitter now. I am glad I learned to knit just for this one moment in time. This is probably the best Friday night I have ever had in my life. Wow. Okay, enough with the ambiguity. Let's get down to details! I should probably start with my day at work. Someone had to pull me aside and tell me that I was distracting my co-workers since I was jumping around all day. 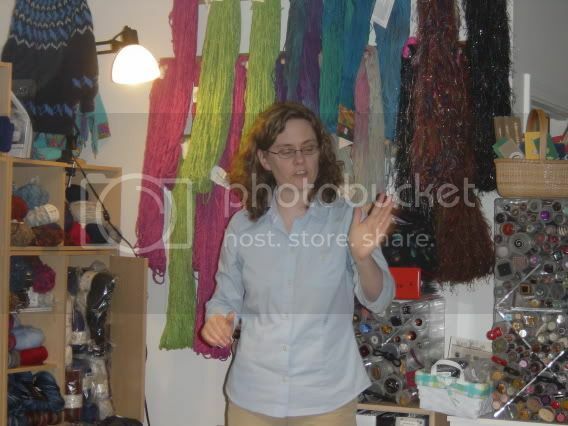 I explained to everyone that I was going to see the Yarn Harlot. People just looked at me curiously when I told them this. I used to be offended when I got those looks, but now they don't bother me. When you tend to begin your stories with "I met this crack user today who told me..." you are used to people looking at you a bit oddly. E and I were set to leave at 4:30, okay 4:20, I mean 4:15, E told me she had to go to the mail room to mail something. It was 4:09! I was flipping out. The anxiety and excitement had hit an all time high and was not prepared for these snafus. E ran down to the mail room and back (the mail room was closed for the day) and we jumped into my car. The drive was going well. We had gotten onto Rt. 146 and were making good time. We even saw a dinosaur (hopefully, I will have a picture of this later)! Then the evilness happened: brake lights. We had hit traffic. The traffic moved along pretty well; however, E has never been in a car with me for a long time and I had not prepared her for my driving attitude. I would not say I have road rage. I do not cut people off. I do do any gestures of any sort. I do yell at the drivers with my windows rolled up. I tend to curse. Once I get out of the car, I am perfectly normal again; it is just the driving. I should also say that I tend to be worse when I am driving on a new road and I am nervous. The drive there was pretty innocuous, but on the way back, well, we will get to that later. Anyway, as soon as I saw the sign for the yarn store, I started screaming. Yes, I was driving, screaming, and pulling into a parking space. It was amazing. As soon as we were out of the car, I started taking pictures. E found it quite humorous and joked with a fellow knitter that I was "very excited." I met some wonderful knitters and ran into my friend Theresa. It was wonderful to be with people who share the same passions as I do. We didn't know each other, but we had so many things to discuss. We talked about socks, felting, and all other things knit. 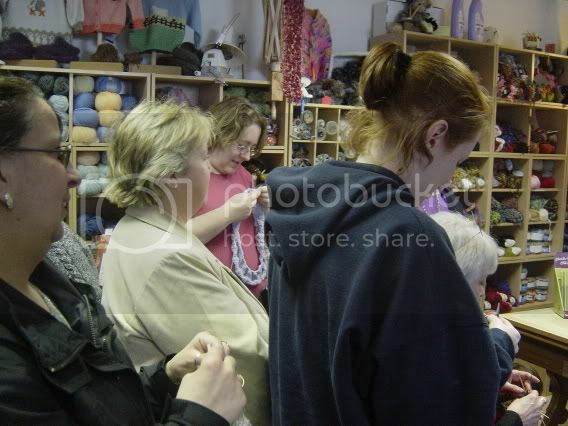 We all just stood around knitting and talking about knitting. 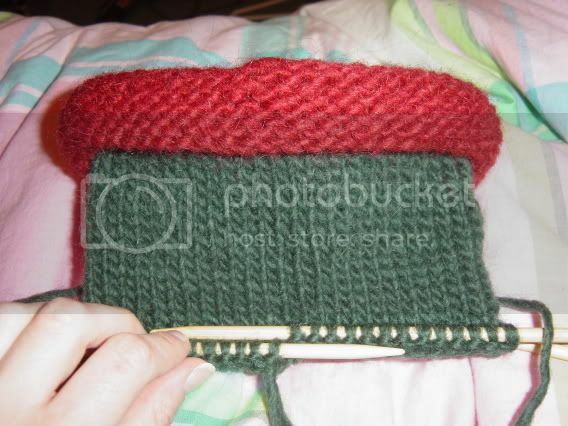 I knit about two inches of my Christmas Stocking while waiting for the Yarn Harlot. It was great! I am glad this was the project I picked, since it was easy to knit the stocking standing up. I just had to knit around and around and around. After a little bit, the Yarn Harlot came. She gave a little talk, which was quite witty. A lot of the talk came from her blog and her books, but it was great to hear her tell the stories. She didn't sound like I thought she would, but she spoke quite well. It was nice to hear jokes that only knitters would get and I would get them. I felt like I was part of the in crowd. It felt so nice to belong. This past year has been crazy with breaking up with my X and trying to recreate an entire social group (it was a big mess). Moving on...it was great to meet so many people with whom I had so much in common. 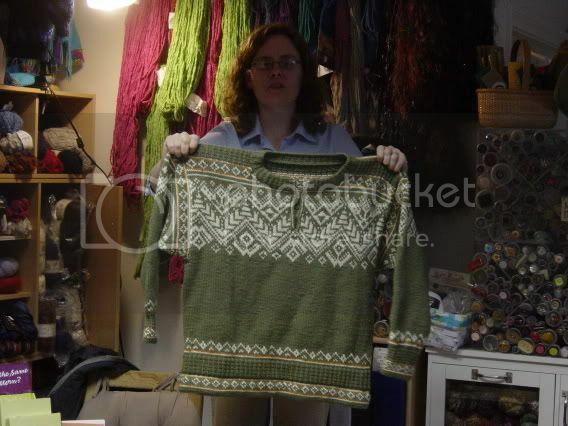 The Yarn Harlot also showed us her beautiful Olympic Sweater! After her talk, she signed books. When I got to the front of the line, I told her about how I was the Michelle Kwan of the Knitting Olympics. 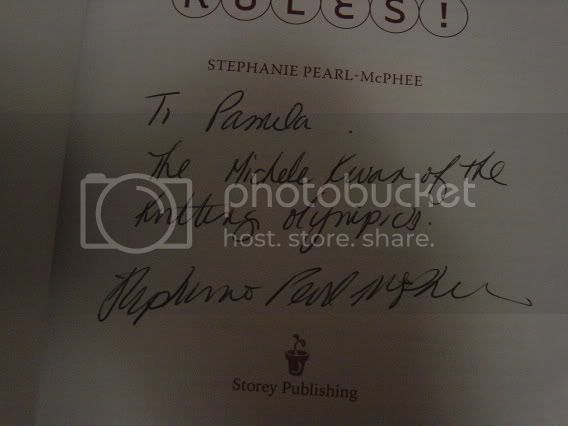 She even signed my book like that. I had this need to tell her this since it happened, and it felt really great to tell her that. I even got a picture of me with her. I think I am going to print it out and get it framed. This was seriously more exciting than meeting a movie star or political official. 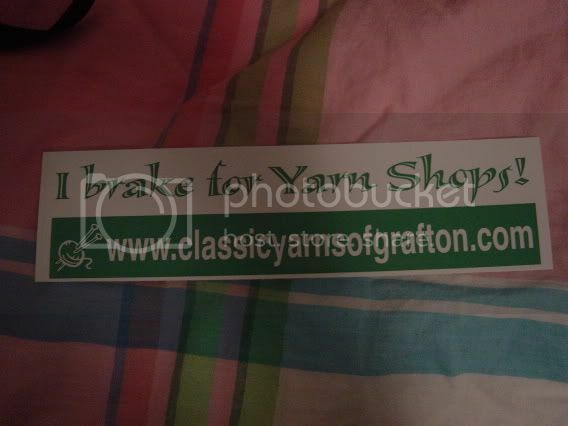 I also got a free bumper sticker, which isn't just advertising the store but the motto of my family's drive from Rhode Island to Florida this summer. 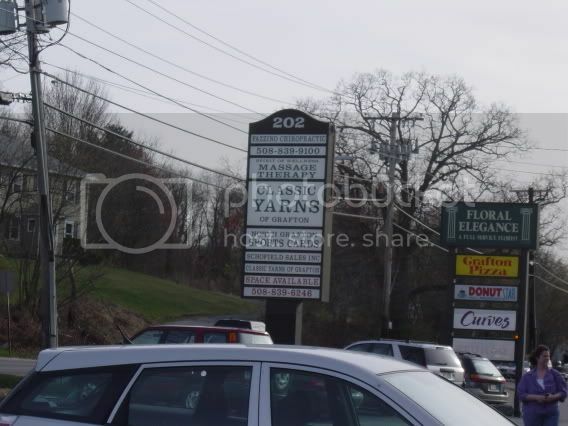 :) Hey, my dad will want to have cigar breaks, I think it is completely reasonable to match them up with yarn stores. On the drive back, every crazy driver was out on the street. Granted, I was driving slowly (not incredibly slow), because I wasn't familiar with the roads and it was dark, but some of it was completely unnecessary. It was really upsetting to have such a great night be lowered in greatness because the drive back was awful. It probably wasn't that bad, but I was nervous about the driving and I was tired. It had been a long week. I am hoping that the drive back will quickly become a distant memory and the talk will remain the main memory for me. More tomorrow when I am less sleepy. Wow - that was speedy! So fun to see you there. And I'm all over Sunday at 8. See? I remembered. 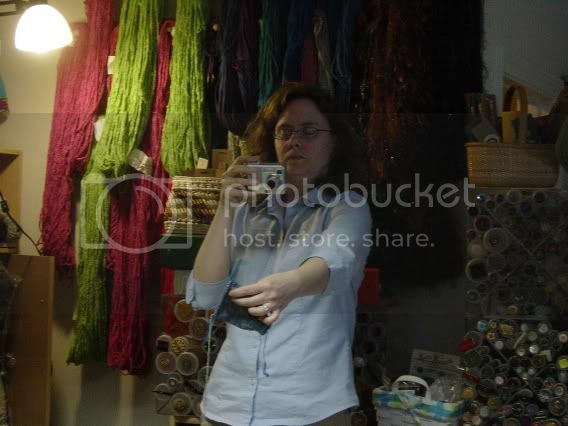 It was great to hang out in the yarn store with you! Sorry your drive back was less than wonderful - repress that memory. Good luck with the move to Gainesville - hope you find some friendly knitters and a helpful LYS. glad you had such fun time ( - the drive back)! It was nice to meet you, too!